The Nerd Fashion Show featured the latest in geek chic, and no con would be complete without a cosplay contest. Judging by the amount of stunning cosplay both on the show floor and in the lobby, competition this year was stiff. I noticed that the amount and quality of panels has been steadily increasing each year at the LBCC, and several of the panels featured advice on breaking into a variety of fields within the pop-culture spectrum — this is an important facet and key to bringing new voices to the fore. There was also Space Expo, with Jet Propulsion Laboratory scientists on hand to give insights and share findings regarding the Juno mission and the Cassini satellite orbiting Saturn. 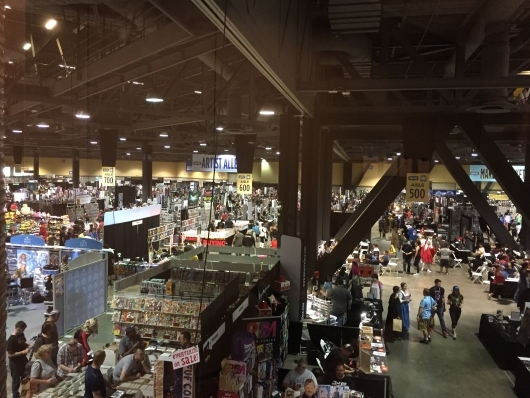 Overall, the Long Beach Comic Con was fun, affordable, and accessible; the latter two qualities beginning to diminish at the giant cons. Given its track record, I fully expect next year’s Long Beach Comic Con, which will be held on September 8 & 9, to be even bigger and better.